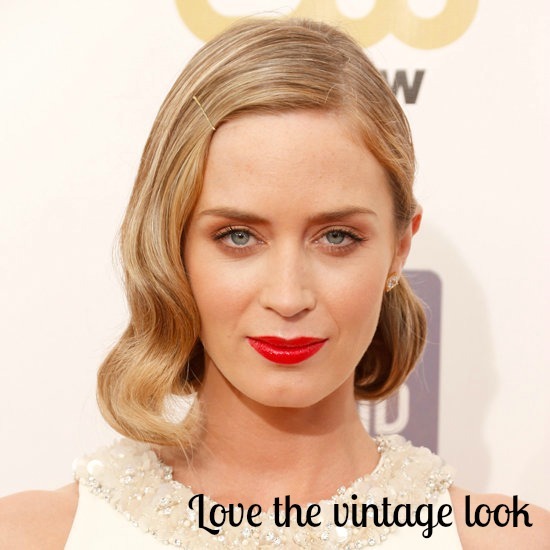 Critics Choice Awards showed celebs are still being swept away with side styles and waves. A deep parting and hair left in tumbling waves on one shoulder is truly becoming a red-carpet staple for stars. I loved Amy Adams light auburn waves. They looked so effortless and worked perfectly against her outfit, slightly different from the rest as she stuck to a middle parting. Naomi Watts, and Emmy Rossum also went for a side style. Naomi going for a more relaxed fluid wave, which looked beautifully effortless and Emmy opting for a glamourous vintage-inspired style, high gloss perfection! Also have to mention Emmy's dress. Which was incredible, it looked like a cosmic space sky. I do believe it was Carolina Herrera, but let me know if I'm wrong. Think my favourite of the night was Emily Blunt, who had her mid length locks waved, with one side placed behind her ear. It looked to me like the ends had been rolled and tucked in to give a uniform 1920's finish. Gatsby hair at its best. Loved the red lipstick to finish the outfit. Special mention to some up do marvels on the night. Eva Longoria, Amanda Seyfried and Jennifer Lawerence. Perfectly executed do's ladies! Emily Blunt looks fab there. Such a nice length when most of them seems to go for longer locks.